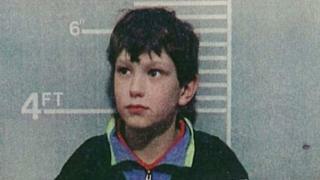 Jon Venables, one of the killers of toddler James Bulger nearly 25 years ago, has been charged over indecent images of children. The 35-year-old, who served eight years for the murder of James, aged two, in 1993, was recalled to prison last year. He and Robert Thompson abducted, tortured and killed the toddler in Liverpool when they were both aged 10. They were released on licence in 2001, meaning they can be recalled to jail at any time if they breach the conditions. Both were given new identities and reporting restrictions mean that Venables' current name, or anything else that could lead to his identification, will remain secret when his case is heard. On 12 February 1993, James - just a few weeks short of his third birthday - was reported missing by his mother from outside a butcher's shop in the New Strand Shopping Centre in Bootle. CCTV images showed him being lured away by Venables and Thompson. His body was found two days later on a railway line. He had been partially stripped and beaten to death with bricks and a metal bar. In 2001, the pair were released on licence from secure children's homes - and granted lifelong anonymity with new identities. In September 2008, Venables was arrested on suspicion of affray after a drunken brawl and was given a formal warning by the probation service for breaching the good behaviour terms of his licence. Later the same year he was cautioned for possession of cocaine after he was found with a small amount of the Class A drug. And in 2010, Venables was sent back to jail for two years after pleading guilty to charges of downloading and distributing indecent images of children and breaching his parole conditions by visiting Merseyside. He was released again in 2013 with a second new identity. When news of the 35-year-old's latest arrest emerged last year, James's mother Denise Fergus said: "Venables has now proved beyond any doubt what a vile, perverted psychopath he has always been." The Attorney General launched an investigation into claims his identity had been revealed on social media. In 2013, two men who posted images they claimed were of Venables and Thompson were given nine-month sentences, suspended for 15 months. Breaking the injunction that bans identifying the pair carries a punishment of up to two years in prison. A CPS spokesman said: "The man formerly known as Jon Venables has been charged with offences relating to indecent images of children. "In order that justice can be done, no further details are being released at this stage and the proceedings are subject to reporting restrictions."